Life In A House of Blue ! : Thursday Morning Fun from TBS…. Home > press > Thursday Morning Fun from TBS…. Thursday Morning Fun from TBS…. Having kids means that you’re constantly reminded of the fact that yes, you are parent. 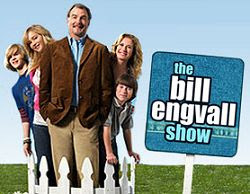 But instead of pretending that your children aren’t the ones running around with no pants, try embracing that special badge of honor that says “what have I gotten myself into?” Relax and enjoy some unconventional parenting insight brought to you by THE BILL ENGVALL SHOW. You decide to trade in your convertible for a minivan and cry the whole way to the dealership. You’ve fixed someone’s hair with spit. You’ve paid a costumed character to show up at your house. No one calls you by your first name anymore. Now you’re simply known as someone’s Mom. There’s an entire box of cereal buried in the cracks between your car seats. And you’ve considered eating it while waiting in the carpool line. Instead of goodnight kisses, you now get goodnight text messages. You’ve threatened competitors at the school science fair. You find yourself wearing your pajamas for a coffee run or to drop off the kids. It’s not like you have time to get out of the car anyway. You’ve been to soccer practice, ballet and story time all before 11am. You have to explain how math will be useful some day. Sleeping late means 8:15 am. You read more than one parenting blog a day. You realize your parents only come visit to see the grandkids. You wipe anyone’s mouth other than yours. You’ve hosted a graduation party for an 11-year-old. You talk about bodily functions more than most doctors. You occasionally forget to bathe. You want to tell your kids about the birds and the bees, but you can’t remember the last time you did it. For more hilarious parenting moments, tune in to THE BILL ENGVALL SHOW Saturday nights at 9/8c on TBS!! Sleeping late means 8:15? Are they kidding? You mean 5:15! LOL! Alot of those - "You Know You’re a Parent When…" are pretty funny. I never saw his show but will have to look for it. I so can relate to this! haha These are great! I love Bill Engvall. I need to watch his show more. I love this guy! I also like to watch Bill when he is on the 'Blue collar comedy tours' shows on the comedy channel with Jeff Foxworthy! I love that they can make us laugh without resorting to cussing or cutting remarks. How funny! I heard about this show the other day, I'll have to check it out.